At my best I am merely competent with auto repairs, and as I have grown older I am less entranced with the idea of spending a half-day on my driveway replacing a part like a water pump or a radiator. 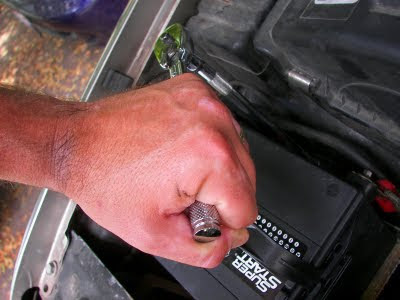 Yet some repairs are just too simple to justify spending extra money for a mechanic to perform the work, such as the battery I replaced on our 1999 GMC Suburban this morning. However, even the easiest auto repairs can turn into mechanical nightmares if you lack the proper tools for the given task. Many times I have given up in frustration on a repair job, only to find that if I had only spent $10 on a spanner wrench or other specialized tool the repair would have been a breeze. My quest for maintaining a well-stocked tool kit has been stymied over the years by my darling children, who think nothing of leaving my tools out in the rain, loaning my tools to friends, or "borrowing" tools that never seem to find their way back to my garage. This morning, though, I was pleased to find that every tool I needed was right at my disposal. 18" socket extension? Right there. 3/16" box wrench? No problem. The battery replacement took less than 30 minutes, including the time it took me to drive to Murray's Auto Parts and buy the new battery. The only problem I encountered was grounding out the battery with the socket wrench against the fender metal as I tightened the post nuts, sending a shower of sparks and a couple hundred amps of electricity coursing through my arm. As I mentioned earlier: I am at best only competent at auto repairs.